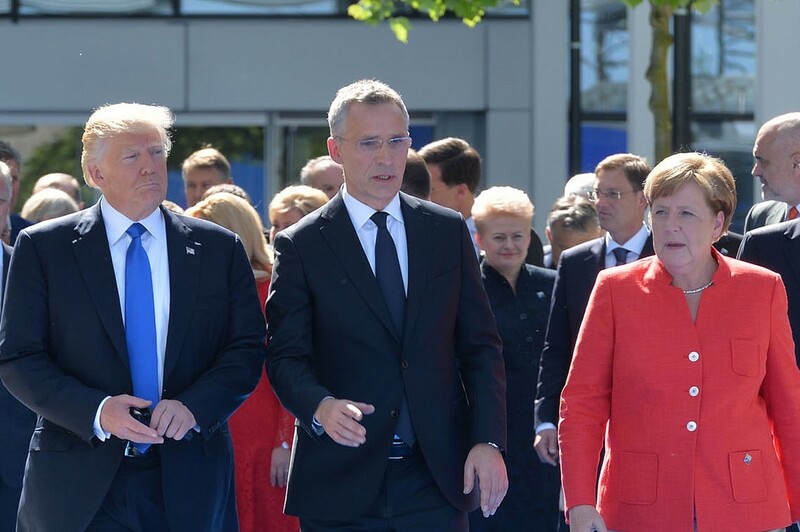 Donald Trump, Jens Stoltenberg and Angela Merkel during the meeting of NATO Heads of State and Government in Brussels, May 25, 2017. United States President Donald Trump on July 11 praised America’s relationship with Germany – one of its most important strategic partners. But this was after he called Germany a “captive” of Russia. As reported by Deutsche Welle (DW), Germany hopes the 1,200km Baltic Sea pipeline will provide direct delivery of more than 55bn cubic meters (2 trillion cubic feet) of Russian natural gas starting in late 2019. The US and some East European countries are worried the deal could make Germany overly reliant on Russia at a time of heightened diplomatic tensions between Moscow and Nato. Meanwhile, addressing reporters after her meeting with Trump, Angela Merkel was more reserved with her assessment. She said the US and Germany are “good partners, and we wish to continue cooperating in the future”. In turn, German Defence Minister Ursula von der Leyen told reporters in Brussels that Germany is “used” to Trump’s criticisms. She admitted that his criticism of Germany’s low spending on defence was fair, but appealed to his background as a businessman to consider the country’s defence contribution in a wider light. “I’d like to see the businessman Donald Trump not only look at the balance sheet, but at the output,” she said, adding that Germany contributed the second-highest number of troops to Nato and has been its second-largest net contributor. In Brussels, European Council’s President Donald Tusk hit back at Trump for criticising Europe almost daily. “Dear America, appreciate your allies, after all you don’t have that many,” he said. As reported by CNN, French President Emmanuel Macron stepped into the controversy on July 11. Asked whether he believes Germany is beholden to Russia as Trump claimed, Macron quickly disagreed. “No. No,” Macron said, sitting alongside the US President on the sidelines of the summit. Macron added that he and Trump “just discussed” this and said “we work together”.